Ubisoft announced Tom Clancy’s The Division during the last spot of its E3 Media Briefing, following the same formula it used last year when it wowed the crowd with Watch Dogs. While this is yet another Tom Clancy game, it doesn’t follow the typical Splinter Cell or Rainbow Six models, although it does rely heavily on Clancy’s signature “the nation in disarray” type of storyline. While the game was a last-minute tease and won’t be out for some time, it looked incredibly impressive. Killer flu. Set three weeks after a pandemic brakes out in New York City during Black Friday, you are a part of “The Division,” a group of fighters who continue to operate even though basic government operations broke down. You’re part of the Directive 51 response to a national emergency of this level, which is an actual plan put together by the Bush administration back in 2007. Unlike modern shooters, this scenario has you responding as part of an elite soldier in kitted-out uniforms – you’ll more closely resemble an insurgent with a cobbled-together outfit. These fighters are meant to be hidden and embedded throughout the country’s infrastructure so that they can continue to operate even in the event of a total breakdown, and this is tailored a bit to the drop-in, drop-out style of this online game. As the nation itself has been tossed into chaos, based on an actual Operation Dark Winter exercise in 2001 that showed how something like this could cripple the country, the forces that continue to operate will no longer be able to do so using traditional methods, which would explain why squaddies would join you en route to your destination and mission objectives. An open-world, online shooter. 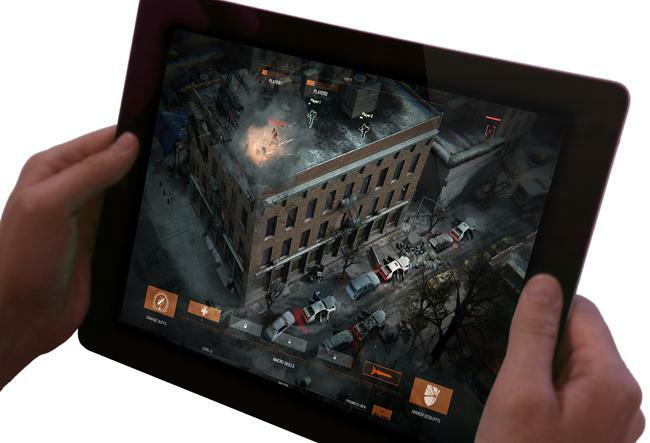 Although The Division is being billed as an online, open-world RPG, the gameplay revolves around the standard third-person, cover-based shooter model. Ubisoft mentioned that the game can be played solo but stressed that it’s meant to be played with other people. During our gameplay demo, a squad of two was exploring the near-ruins of New York City before engaging in a firefight outside of a police station. Joined by a third squadmate and a player on a tablet controlling a UVA, they took down a force of AI shooters fairly quickly. Using advanced tech like “Seeker Mines” that roll along like a smartball, they searched for hidden enemies. The tablet player was able to pinpoint enemies behind cover for us and participate in the same game audio chat channel. During our extended demonstration, we learned they can also buff your squad’s armor, heal team members, and even build up XP to enable missile strikes and more. It was all shown in real time, with the tablet player seeing a live view from above featuring the exact same feed that the players themselves were seeing. The tablet integration here was fairly deep and does not feel like a tacked-on gimmick. Ubisoft is spreading this concept across all of its top-tier games, and you’ll see it in everything from the newly-announced The Crew and The Division to Assassin’s Creed IV Black Flag and Watch Dogs. As Ubisoft is pushing the game as an RPG, it said that there will be a lot of loot to be found, which, in the case of our demo, was the discovery of a new assault rifle after freeing some trapped police officers who gave us the usage of their weapons cache. Very beautiful. The Division is built for next-gen systems and is running in Ubisoft’s proprietary “Snowdrop” engine. It also looks extremely gorgeous and fluid. Part of the promise of next-gen systems is no load time, and during the entire E3 demo, things were smooth and solid, and the graphic impressed us at every turn. After a successful mission, your team can call for extraction with a signal flare, and you have to wait for the extraction to occur afterwards. However, during these “extraction events,” you are vulnerable and can be attacked by other groups of online players, although this was only teased during our demonstration. The Division has a long way to go, and we would like to see a lot more integration with other players and see how the RPG elements unfold. Is it simply hunting for loot, or is there a deeper system in place? We got a quick look at a skill tree on the player’s wrist-mounted computer, but not enough to tell us how that system will work and if the game supports classes. One of the other players healed two of our squadmates, but does that relegate you to the healing role, or can you still dish it out in a firefight? We’ll be seeing more of this game in the months to come ramping up to a 2014 release for Xbox One and PlayStation 4, and we hope it continues to look this good.